Page revised in January 2018. Links to this page can be found in Book 2, Map B3, Day 1, View C9, Rione Campitelli and Rione Monti. We know that Giuseppe Vasi sold his plates also separately from the books which they illustrated. This 1752 view of Piazza del Colosseo was most likely the etching which he sold most. 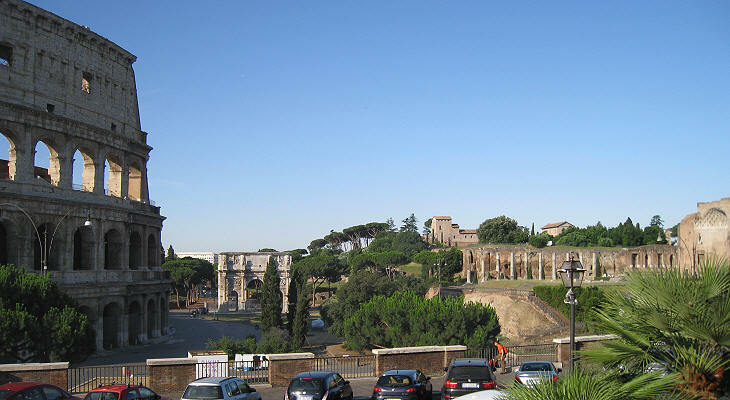 The amphitheatre was the symbol of Ancient Rome and no visitors would leave Rome without a "postcard" of it. Vasi depicted the monument from the best possible point i.e. from the hill to its north in order to show the side of the amphitheatre which retained the outer ring. The result however was not as impressive and dramatic as that achieved by Giovanni Battista Piranesi in a 1761 etching (it opens in another window). The view was taken from the green dot in the map below. In the description below the plate Vasi made reference to: 1) Anfiteatro Flavio; 2) Arco di Costantino; 3) Ruins near S. Maria Nuova (Tempio di Venere e Roma); 4) S. Bonaventura. 4) is shown in another page. The small 1748 map shows also 5) Domus Aurea; 6) Terme di Tito; 7) Terme di Traiano; 8) Sette Sale. The dotted line in the small map delineates the border between Rione Monti (upper part) and Rione Campitelli (lower part). Vasi forced perspective laws to show the whole building and at the same time the apse of Tempio di Venere e Roma. Today the area between Colosseo and Arco di Costantino is reserved for pedestrians, but until 1980 the amphitheatre was a sort of gigantic roundabout. This was an effect of the 1932 opening of Via dei Fori Imperiali which channelled a large number of cars towards Piazza del Colosseo. The saying is attributed to the Venerable Bede, the first English historian (672-735), who learned it from Anglo-Saxons pilgrims. It probably made reference to a colossal statue of Emperor Nero, rather than to the amphitheatre, but all British travellers had it in mind when they visited Rome. Colosseo was named after a nearby colossal statue of Nero as Helios, God of the Sun. Some archaeologists believe it was made of bronze and that it was re-used by other emperors. According to this opinion parts of it are now on display at Musei Capitolini. Anfiteatro Flavio is a more appropriate name for the amphitheatre, because it was built by the emperors of the Flavian dynasty. 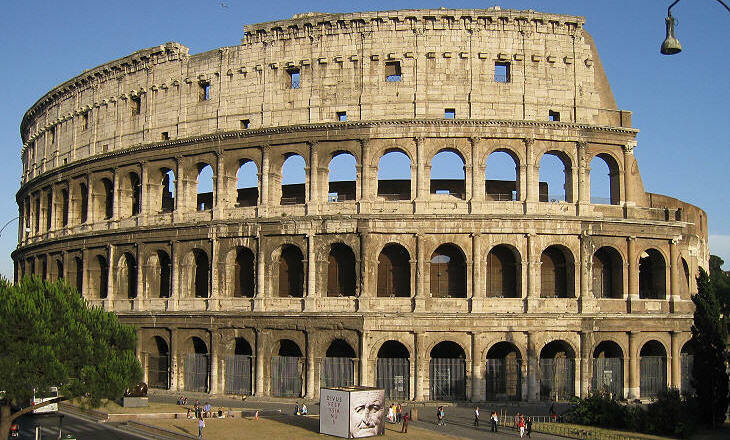 Construction started in 72 AD at the initiative of Vespasian; it was inaugurated in 80 by Titus and some facilities were completed by Domitian. Its exterior with semi-columns of the three orders (Doric, Ionic and Corinthian) and its attic with low Corinthian pilasters (it opens in another window) became a reference pattern for many architects during the Renaissance and afterwards (e.g. for Gian Lorenzo Bernini in the design of the façade of Palazzo Barberini). 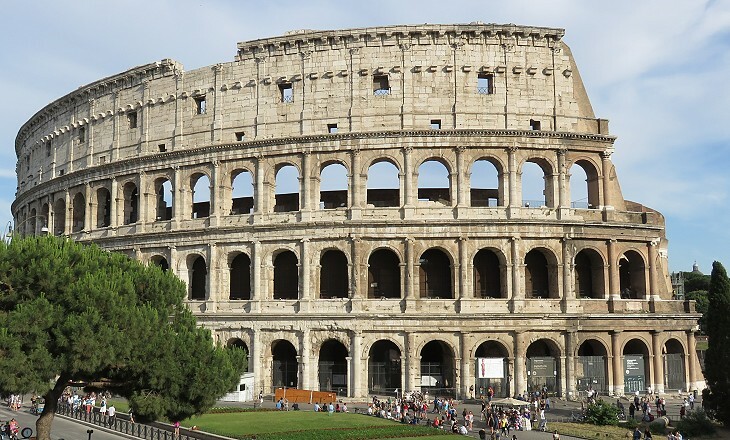 The design of Colosseo shows the skill of its architects in providing effective solutions to the many issues they faced because of its large audience (perhaps up to 70,000). Each of the eighty entrances was numbered so spectators knew where to access the building in order to reach their seat. A series of vomitoria, large internal staircases, allowed easy access to the three tiers into which the amphitheatre was divided: ima cavea and media cavea, the two lower tiers had numbered marble seats; summa cavea, the upper tier, was reserved for those who bought the cheapest tickets; they sat on wooden benches or they stood on their feet. A sort of awning (velarium) sheltered the audience from the sun. 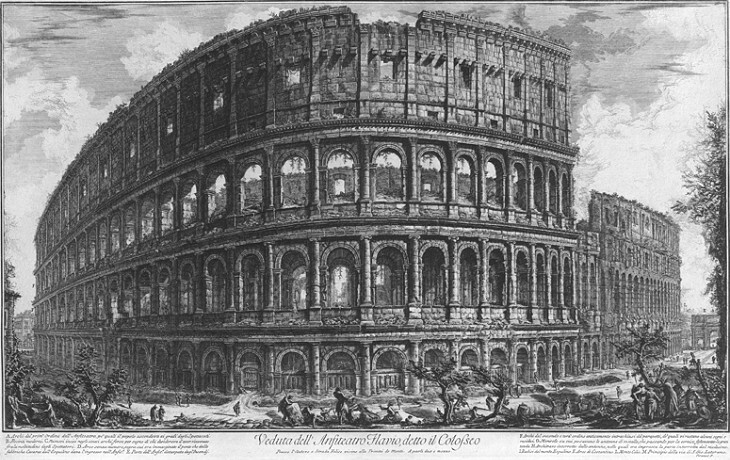 Today the interior of Colosseo is entirely bereft of its decoration, but we know that every element of the building was carefully thought of also from an aesthetic viewpoint; each tier was divided into sectors and to facilitate their identification they were separated by low marble screens which also served as handrails. 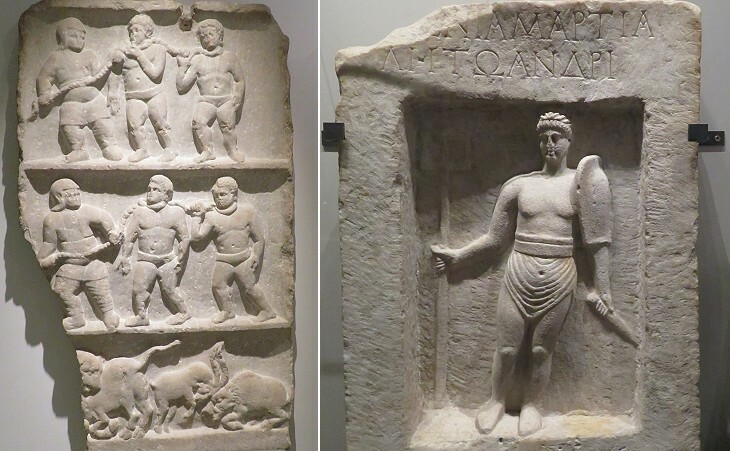 These were all decorated with a variety of reliefs. 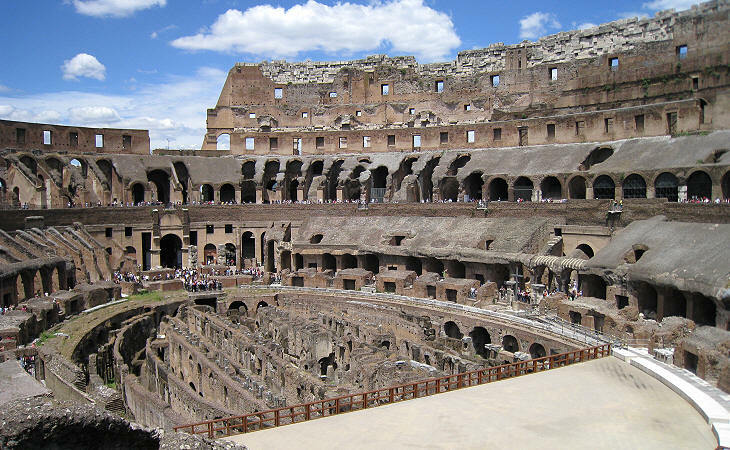 The audience gathered in Colosseo to watch gladiatorial fights and wild beast hunts. The gladiators were so named after gladius, a short sword which was part of the equipment of a Roman legionary. 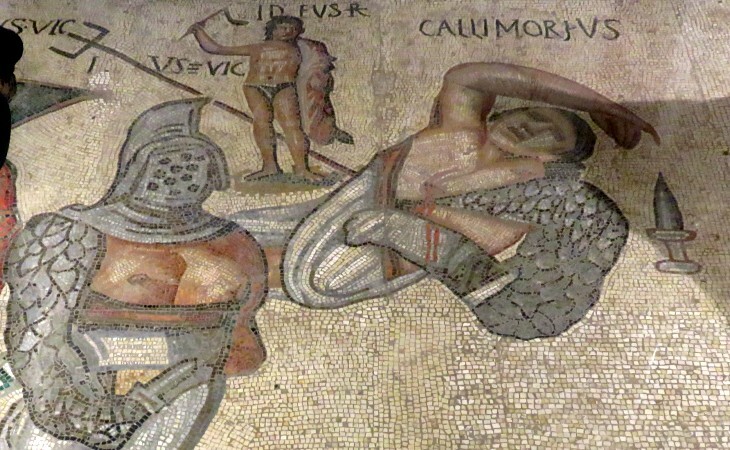 Those who fought in the amphitheatre usually did not have the same weapons: the retiarii fought with a net and a trident and they did not have body protection apart from a heavy bandage on their left arm. Those fighting with a sword fell into different categories based on the other equipment (shield, helmet and armour) they wore. 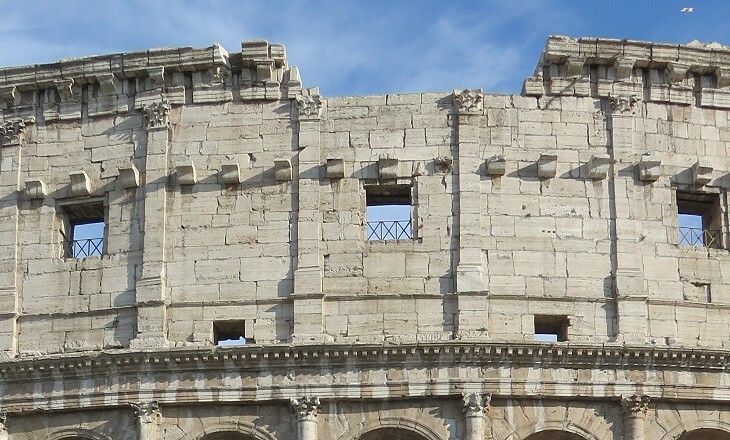 Gladiatorial fights were popular throughout the whole Roman Empire and all towns of some size had an amphitheatre. 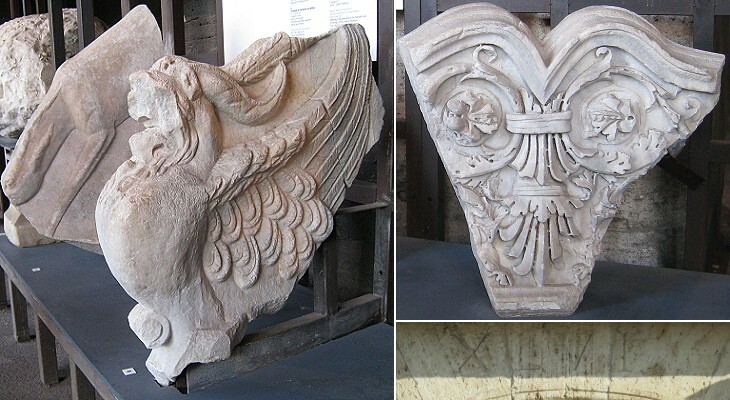 Statues, mosaics, reliefs, inscriptions, etc. have provided archaeologists and historians with a large documentation on these fights and on those which involved wild beasts. 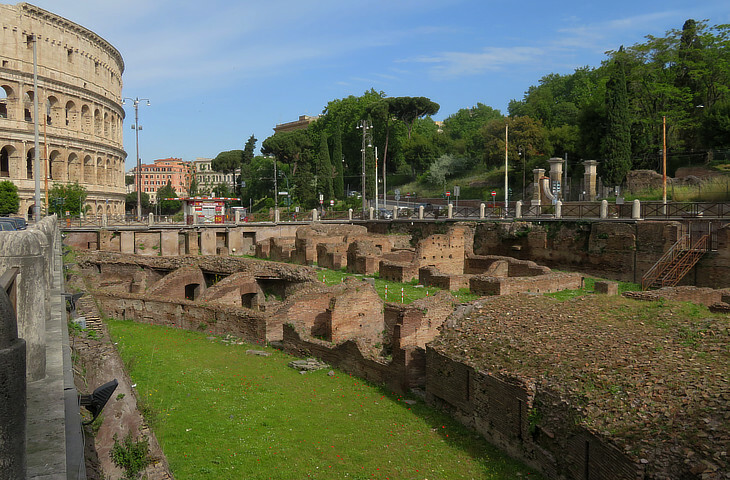 Smaller buildings housed stables, barracks and training grounds and were linked to Colosseo by underground passages; the large barracks called Ludus Magnus (Great Game) are now partly visible in an area excavated in the 1960s. The gladiators practised in a small scale replica of Colosseo. Sand was strewn on the ground to reduce the effects of falls and to absorb the blood. The word rena (sand) eventually became a simpler way (arena) to refer to the amphitheatre. In 438 Emperor Valentinian III closed the gladiators' schools and performances were limited to the hunting of wild beasts. The invasion of northern Africa by the Vandals interrupted the supply of lions and other wild animals which were replaced by bears from the Apennines. The last performances took place in 523 during the reign of the Ostrogoth King Theodoric. You may wish to read the Colosseo playbill Mark Twain found in 1867, most likely on April Fools' Day. 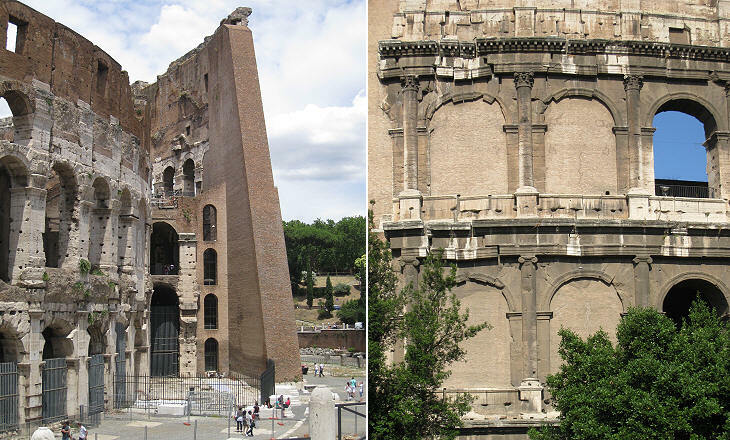 During the Middle Ages Colosseo was fortified by the Frangipane, who erected a wall around it using Arco di Tito and Arco di Costantino as gates. In the XIVth century the building was placed under the protection of the Senatore di Roma and the Conservatori, his four assistants, but this did not prevent the usage of its fallen parts for calcination (for lime-making) or for decorating the façades of churches (e.g. S. Agostino) and palaces (e.g. Palazzo della Cancelleria). In 1704 Pope Clement XI did not hesitate to use the travertine blocks which had fallen because of an earthquake to pave the stairways of Porto di Ripetta. 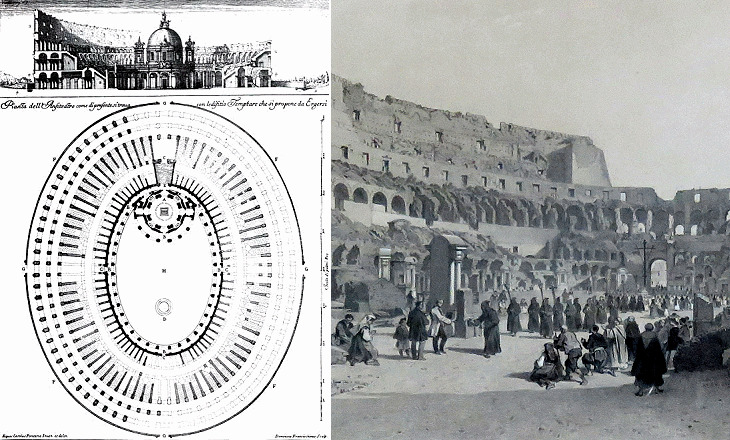 At the beginning of the XVIIIth century Carlo Fontana developed a project for building a church inside Colosseo. 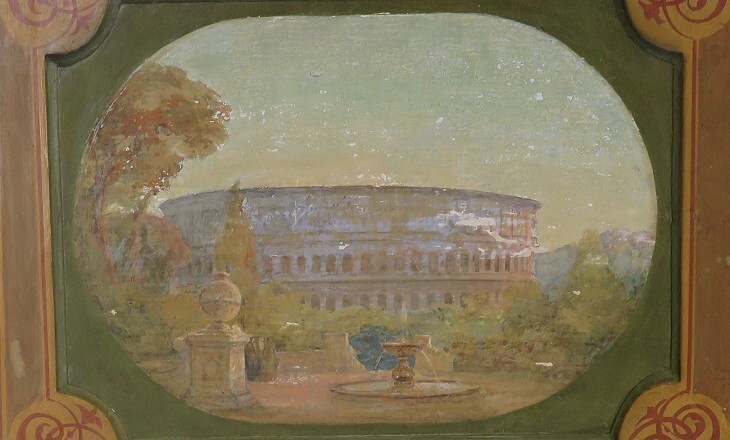 The project was eventually shelved, but the drawing supporting it shows the condition of the monument at that time; it was practically open on its southern side (right side of the plan); this because it had been built on the site of a pond of Domus Aurea, Nero's palace. This side, but not the outer ring, was rebuilt in 1845 by Pope Gregory XVI. 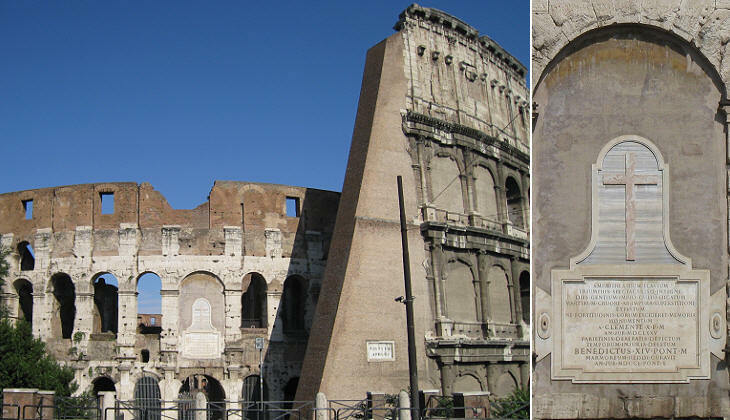 In 1750 Pope Benedict XIV, in order to preserve Colosseo from further damage, prevented access to it by closing the arches on the ground floor; he dedicated the ancient monument to the Passion of Jesus Christ in memory of the many martyrs who (according to tradition) died there. The Pope built fourteen Stations of the Cross and placed a large cross at the centre of the arena (now it has been relocated to its northern side). Colosseo became the scene of many processions and religious ceremonies, in particular during the Holy Week. Popes led a torchlight procession inside the amphitheatre on Good Friday until 1870. The procession was reintroduced in 1965, but it takes place on the terrace of Tempio di Venere e Roma. One of the most effective actions aimed at preventing the further fall of the outer ring was taken by Pope Pius VII. The wall shows some of the arches which were about to collapse. A similar, but less imposing wall was built at the other end of the outer ring. 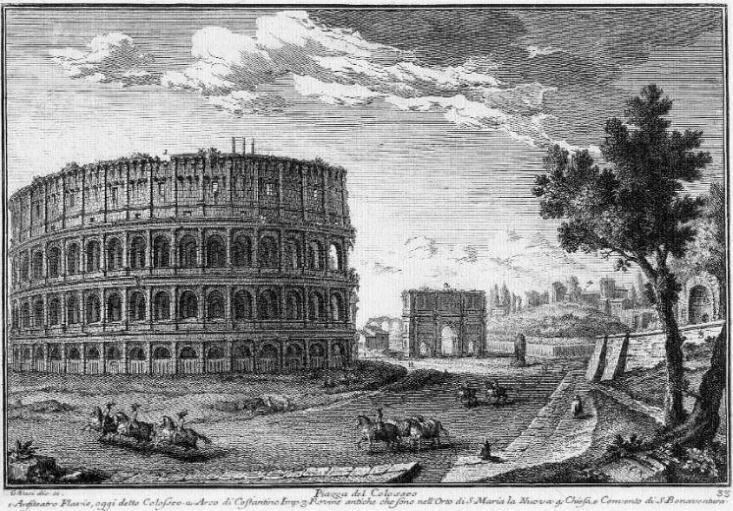 Colosseo was covered by a thick vegetation (Richard Deakin in Flora of the Colosseum of Rome, published in 1855, identified 418 species of plants) and it was possible to climb it to its highest point. You may wish to read Henry James's 1873 and William Dean Howells' 1908 accounts of their visits. Today the Christian aspects of Colosseo with its crosses and processions are overlooked and the amphitheatre is now seen only as the most impressive symbol of the Roman Empire. A moonlight visit to Colosseo became a must for Grand Tour travellers. My farewell to Rome was heralded in a particularly solemn manner: for three consecutive nights a full moon stood in a cloudless sky, diffusing its magic over the immense city, and more than ever before, I felt myself transported into another simpler and greater world. At the end of each day, spent in distractions mingled with sadness, I took a walk with a few friends, and on one evening I went out quite alone (..) when I approached the grand ruins of the Colosseum and looked through the gate into the interior, I must frankly confess that a shudder ran through me, and I quickly returned home. Next plate in Book 2: Piazza di S. Giovanni in Laterano. Next step in Day 1 itinerary: Chiesa di S. Clemente. Next step in your tour of Rione Monti: Villa Altieri. Next step in your tour of Rione Campitelli: Casino Fini. Da Flavio Vespasiano fu principiato questo meraviglioso edifizio per solennizzarvi spettacoli, e feste pubbliche, e poi da Tito suo figliuolo fu terminato, e dedicato in onore di suo Padre. Era capace di settecentosette migliaja di spettatori, senza che uno impedisse l'altro, e però vi furono fatte delle feste maravigliose e splendide, e delli spettacoli molto crudeli, e tal volta a danno de' Cristiani, non pochi de' quali vi soffrirono il martiri. Si disse Colosseo da un colosso, che vi era alto 120. piedi rappresentante Nerone. 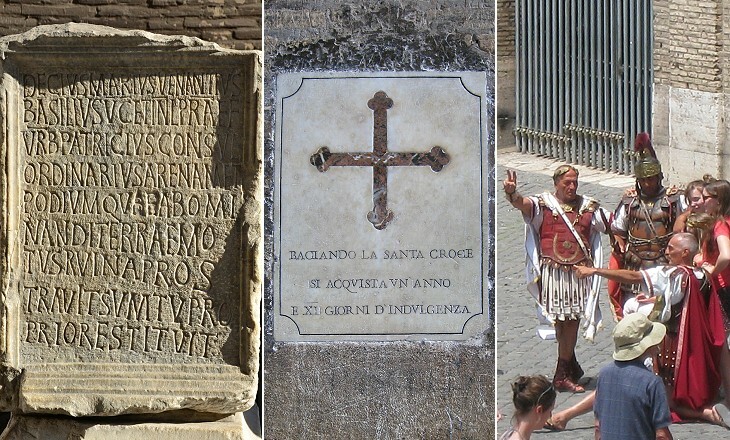 In oggi svanire tutte le superstizioni, e crudeltà de' gentili, rimbombar si sentono spesso in in mezzo a quelle maravigliose rovine le lodi del Signore, e della santissima sua Croce, e Passione, poichè per fare onore a' santi Martiri, vi fu eretta una piccola chiesa, e 13. cappellette, nelle quali li rappresentano i misterj della passione del nostro Salvatore, ultimamente rinnovate dal Pontefice Benedetto XIV. ed arricchite delle indulgenze della Via Crucis.